Filmawit Layn, a ten-year-old girl at Addishihu Primary School in the Emba Alaje Woreda (District), Tigray Region is the type of student and daughter most parents dream of – smart, beautiful, and extremely confident. EMBA ALAJE WOREDA, TIGRAY, 01 December 2017 – Filmawit Layn is from rural Ethiopia and attends public school, where although school structures and teachers are in place, the quality of teaching has been notably weak. 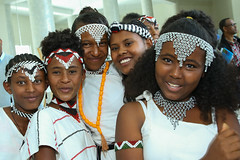 In Ethiopia, less than half of all primary school students are passing their end-of-year exams, and only 4 per cent of Grade 2 students can proficiently read (NAEA 2016 and EGRA 2014). These statistics raise concerns if children – like Filmawit – are actually learning at school and developing skills that will help them reach their full potentials, realize their dreams, and lead their country one day. To address these concerns, UNICEF and the Government introduced the Assessment for Learning (AfL) initiative – where teachers are equipped with skills, resources and a supporting environment to shift their teaching approaches to become more active, continuous, competency-based, and engaging for students, with the ultimate goal of improving learning outcomes. Through UNICEF-designed capacity building workshops, teachers are learning how to collect real-time information on their students’ learning levels. This way teaching is better informed, lesson planning is better prepared, and wider support is given to children. 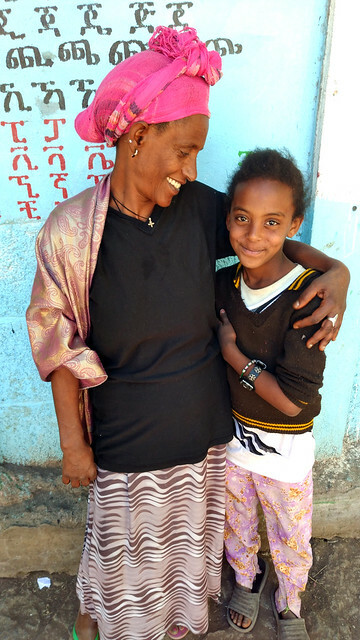 Filmawit lives with her grandmother, Belaynesh Mengiste, who fortunately understands the value of education. Belaynesh was just in 4th grade, when she had to leave school to fight in the terrible civil war against the former Derg Regime, putting an end to her childhood education. Thus, she does not want the same thing to happen for her granddaughter. While most parents require their children to help out with livelihood chores (farming, caring for livestock, collecting water), Belaynesh instead decided to enroll Filmawit in extra language classes. Balaynesh’s goal is for Filmawit to score high grades on her final primary exam so that when she reaches 8th grade, she could be accepted in the elite Kalamino Secondary School in Mekele where the smartest children in Tigray go to. It takes not only teachers, but an entire community to bring quality education to girls like Filmawit. With AfL, parents and caretakers – like Filmawit’s Grandmother, Belaynesh Mengstie – have begun to play a more active role in the learning process of their children. Before AfL, most parents hardly knew what was happening at school. Since the implementation of AfL, many schools have now started a tri-partite agreement among the student, teacher, and caretaker, where they agree on goals for the year – per subject – and review where they stand on a monthly basis. Filmawit is lucky to have such an inspiring 4th Grade homeroom teacher. Etenesh Mulugeta is the focal point for AfL at the school. 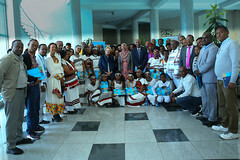 The UNICEF AfL training is normally provided to each school’s director and one or two teachers, and Etenesh was one of the beneficiaries of the training. “I am so happy to have been part of this important training and will train others. It makes life so much easier!” said Etenesh. She trained all teachers in the school, along with other teachers in the region (a total of 135 teachers). She sees vast improvements in learning because of the new techniques, mainly regarding reading and writing, where she measures levels of all of her 57 students on a monthly basis. This approach encouraged her to develop new innovative ways to fill the learning gaps, for example, by establishing peer groups in children’s neighbourhoods so they can support each other after school. In Filmawit’s woreda where 57 primary schools are present, Tadele Berhe Woldu serves as the woreda coordinator for curriculum development. He explained that before AfL, when the schools reported on end-of-year exams, most schools gave students passing marks of 100 per cent. 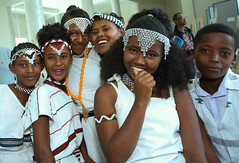 However, when the woreda administered the exams, the average was actually 56.8 per cent who passed for Grades 1-4. This happened because the schools used to be rewarded if all students passed, which resulted in teachers preparing simple exams to ensure that all the children passed. Now, the woreda sends experts to check the exams before they are administered, to ensure they reflect the MLCs. “We knew the schools were cheating when all of them reported a 100 per cent passing rate. This is not good for our nation … In the end the children will not have the skills to get jobs. But now, this problem is totally changing,” said Tadele. The Government has set a goal to create a new learning generation for the country. But real learning can only be achieved if a system of teachers, school administrators, and government invest in strategies to improve the quality of teaching; if teachers are qualified, given appropriate learning materials, and taught clear methodologies to educate students. And teachers can only provide quality support if they have a system assisting them at the collegiate, woreda, regional and national levels. AfL fits within existing educational structures, and has the utmost involvement by parents and caretakers, making it more sustainable and long-lasting. It was introduced in Ethiopia in mid-2013 and has since expanded to eight regions (includes the six regions of Amhara, Harari, Oromia, Somali, Tigray, and Benishangul-Gumuz, as well as the city-states of Addis Ababa and Dire Dawa), with the plan to incorporate it in all eleven regions of the country. With AfL an entire system is working together to help Filmawit realize her dreams to become an engineer so she can build a better future for her country, and even more so, to become a great leader in Africa. Next Next post: A child’s example demonstrates the need for integrating educational services for refugees and host communities in western Ethiopia.